I'm getting some insider info on the possibility of a major DC area art gallery which may be about to close. Actually, no one quite knows what Lehman Brothers, the financial services firm that filed for bankruptcy protection on Sept. 15, will do with its 3,500-piece art collection, but with works by such bankable artists as Jasper Johns and Andreas Gurky, it is likely to be on sale at a major auction house near you. 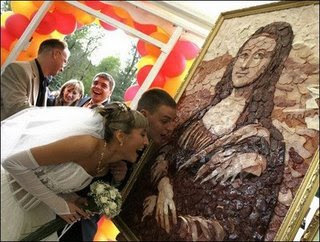 "The sausage art is now popular in Russia. They have made some major masterpieces out of sausages and wurst and put on display so that anyone can eat them."